Design learning doesn’t have to end during the summer holidays and it can be a perfect time to combine travel with design exploration. 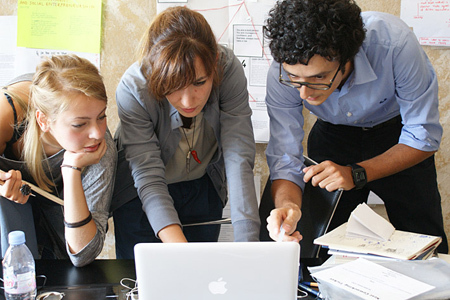 This summer, three new design summer schools will be launched in Lithuania, Portugal and Italy. These three programmes, as well a fourth in Berlin will all use an inquiry into place to frame a distinct design learning experience. The Porto Design Summer School (8-20 July 2103) is be an intensive two-week programme focused on editorial design and typography. 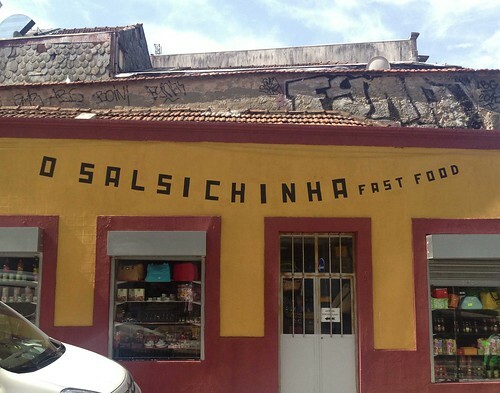 Located in Porto, Portugal, the start of the course will give attendees some grounding in locale with tours that delve into the local history through the architecture and typography, paying special attention to the local heritage of vernacular lettering and vintage shop signage. 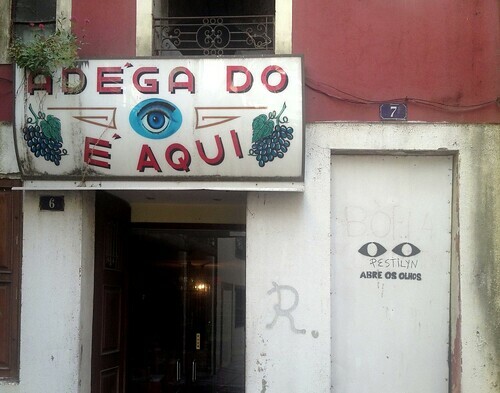 Hand painted and vintage signs in Porto, Portugal. Top: Onlab Summer School 2011 participant Gloria Zanotti (Italy). In addition to fostering technical and conceptual design skills, the course will also address editing and notions of authorship. Lectures, such as ‘Design as storytelling’, ‘Can design make you cry?’ and ‘Think less, make more’ set the tone for the outcome driven course that will ultimately result in a publication that draws inspiration from the city. 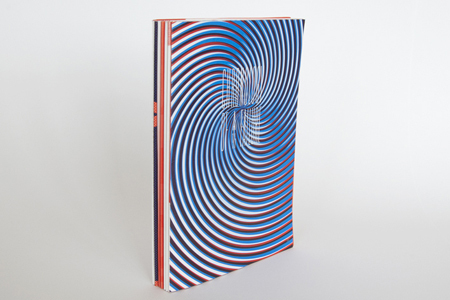 The selection of tutors including Hamish Muir, Jessica Helfand, Jonathan Barnbrook and Andrew Howard, represent a blend of typographic and critical design strength. 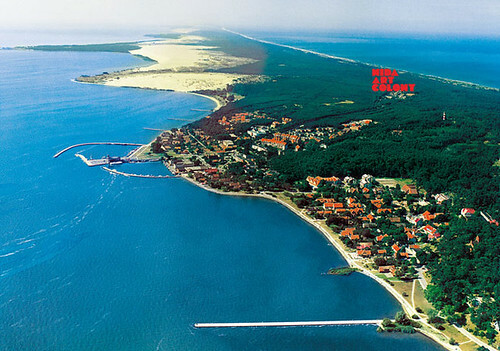 The Summer Sessions (10-25 August 2013) taking place at the Nida Art Colony in Nida, Lithuania will take a more cerebral approach by using the physical surroundings of the Curonian Spit as the starting point to inspire, inform and provoke ‘contemporary mythmaking’. The Curonian Spit, an artificial peninsula along the Baltic Sea. The Curonian Spit is an artificial peninsula along the Baltic Sea that is split between Lithuanian and Russian borders. The peninsula is also a Unesco World Heritage site. Although archeological findings date back to the stone age, there seems to be less evidence of recent history. This absence serves as the impetus to develop new myths along with visualising and mapping existing ones. The two week programme developed by Graphic Design Arnhem at the ArtEZ Institute of the Arts will be divided into two parts in which the first week will focus on inspiration, reflection and methodology through discussions, presentations and masterclasses. The second week will be entirely focused on producing a presentable outcome. Participants will produce ‘visual stories and written images‘ that could take the form of a wide range including ‘signs, dreams, suggestions, strategies, performances, recipes, technologies, blueprints, code and codifications, networks and branding strategies’. Arnhem has a broader audience in mind targeting design students as well as creative professionals interested in exploring critical research and practice. It is an opportunity for ‘designers who are interested in challenging the prevailing conventions of critical expression and exploring new branches of design research’. The Azione Summer School (17-20 September 2013), located in Palermo, Italy, will explore the dynamics of cross-cultural interaction in local vs global contexts. The programme will use design as a platform for social interaction, enabling a means of connecting with locals and in turn, better understanding the locale. Participants will interrogate the stereotypes and cultural clichés of Sicily, using them as a point of comparison to other regions and their perceptions. On a broad scale, Azione aims to consider individuality within a globalised world, as well as cultivate the idea of critical consumption (consumo critico). Groups will initially work with Palermo locals using a participatory design process to develop a concept, and then create projects and receive feedback regarding the concept and usefulness. Apropos to such a cultural exploration, the programme will be convened in both English and Italian. In addition to the cultural considerations, the programme will also provide cross-disciplinary collaboration across graphic design, industrial design, architecture and notably psychology. The school is geared toward students of design and the social sciences interested in social interaction and social issues. Azione aims to attract a considerably larger group of participants than the other summer schools. Azione’s 100-plus participants would be broken up into smaller working groups of seven to ten. These groups would be carefully composed to ensure an intermixing of disciplines and nationalities. A book documenting the outcomes of the programme will be available for print-on-demand after the programme finishes. The application deadline for the Azione Summer School is tomorrow, 9 July 2013. 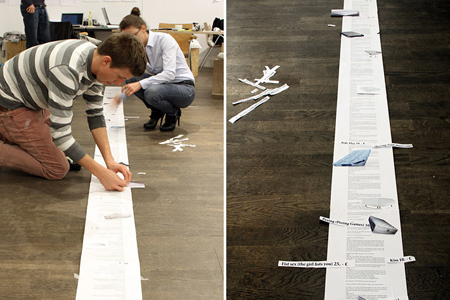 Editor’s note: The Onlab programme (below) has been postponed until 26 Feb – 8 March 2014 and will be accepting applications closer to that time. More information about programme and application details at a later date. Onlab Summer School (18-27 September 2013) will take place in Berlin but will look toward Palestine for their theme with consideration of socio-political aspects of place and belonging. 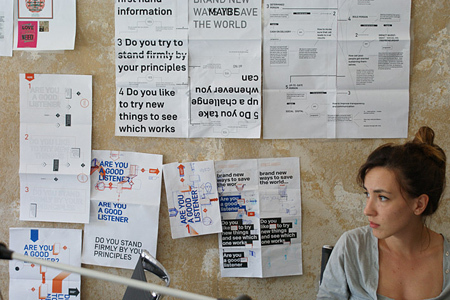 The Berlin-based design agency Onlab, founded by Swiss designer Nicolas Bourquin (see ‘On message’ in Eye 74) held its first summer school in 2011. Each year, an individual or team is invited to propose a topic and act as editors during the programme. This year, a team from Visualizing Palestine will take the editorial reins, providing the students with data and assistance regarding content. Visualizing Palestine describes itself as the ‘intersection of communication, social sciences, technology, design and urban studies for social justice’ that uses ‘creative visuals to describe a factual rights-based narrative of Palestine/Israel.’ Their visualisations tackle issues of displacement, violence, segregation, checkpoints, water and US funded military aid to Israel. ‘Born at Qalandia Checkpoint’ by Naji Elmir (January 2013). Visualizing Palestine uses data visualisation to present the details of the Palestine / Israel situation including the impact that living in an occupied state with military checkpoints has on hospital access and giving birth. Women unable to cross a border to get to the hospital are forced to give birth at the checkpoint. 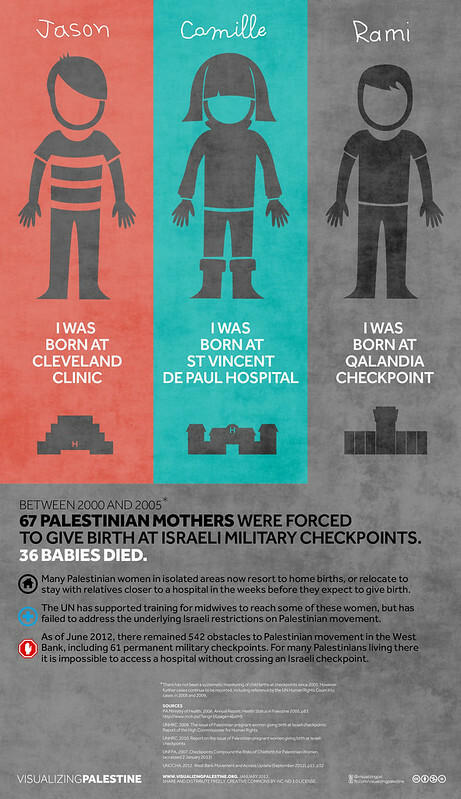 Of the 67 babies born at such military checkpoints between 2000 and 2005, more than half of them (36) died. Editorial design is a primary focus of the summer school, and participants will work in small groups to produce separate sections of an original publication that will be completed and exhibited at the end of the workshop. Onlab Summer School 2011 publication. The topic was ‘Chronology of a failure’ under the guest editors Joana Breidenbach and Dennis Buchmann from Betterplace Lab. Onlab Summer School 2012 publication. 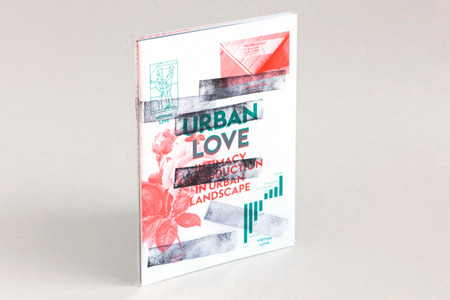 The topic was ‘Love – Intimacy and Seduction in Urban Landscape’ under the guest editor architect Flavio Albanese. Read Linda Kwon’s article ‘Learning on location’, about typography summer schools in Eye 85.